Barron's Pet Handbooks provide information on health care, proper feeding and housing, training and other animal-care details of interest to pet owners. All books are filled with handsome full-color photos, and instructive line art. Cockatiels - parrot-related birds that originated in Australia - come in a variety of color mutations. 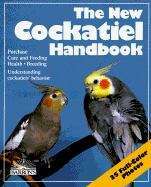 This handbook gives detailed purchase advice, considerations related to caging, proper nutrition, grooming, health care, and keeping the bird safe from household hazards.